Fresh zucchini and asparagus from @farmfreshtoyou + @everydayfood recipe for Linguini with Spring Vegetables = tonight’s healthy dinner. Spring is in full bloom and today’s warm & sunny temps called for something light. Click on the link above for the recipe. (I used two small zucchini in place of snap peas, and topped the finished pasta with fresh parmesan since I didn’t have fresh tarragon – basil would be good too! I can’t stop thinking about the Cappellini Pomodoro I had last night at Ristorante Bella Vita. Perhaps it left an impression because I was surrounded by good company and perfect weather. But the pasta had a perfectly even coating of fresh tomatoes and olive oil. It was flawless. Last weekend David and I went to The Steakhouse inside Agua Caliente Resort and Casino. 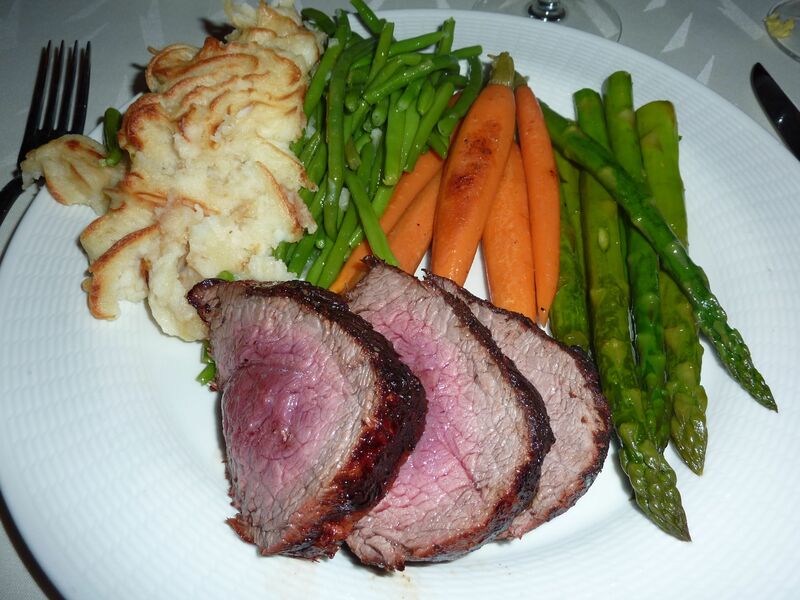 We couldn’t decide which filet to order, so we ended up giving the Filet Chateaubriand a whirl. It was freshly carved tableside and pleasantly tender. Plus, it was served with a copper gratin full of fresh veggies, which were refreshing next to the rich, buttery steak. Also this week, we found ourselves landing practically free tickets to the Paso Robles Grand Wine Tasting in Menlo Park on my birthday, which was a nice treat. My favorite was the Adobe White from Clayhouse Wines, but in general I didn’t know I liked Paso Robles wines so much. Lastly, David surprised me with an iPad for my birthday and I’m excited that both WordPress and Epicurious released first gen iPad apps. So I can cook and blog using my new toy! Pre-washed spinach + walnuts + olive oil = 5 minute pesto. I had a stash of leftover spinach and a sudden inspiration to make pesto. If you have a blender or food processor, it literally takes 5 minutes to whip together homemade pesto. First, I blended the spinach leaves, then added walnuts, then olive oil, salt and two crushed cloves of garlic. One batch for the fridge, and one for the freezer. Fresh, easy, and will be delicious with a variety of pasta dishes. BLT + sauteed apples + provolone = BLTAP. Some consider the classic BLT to be the perfect formula. But in my kitchen, there’s always room for a little creative license. So tonight, I introduced apples into the equation – apples cooked in bacon fat. I’ll admit the flavor wasn’t totally apparent in the sandwich, but it was a good way to reduce the acidity of the apples and make up for a shortage of tomato slices. Plus, who doesn’t love a little extra bacon flavor?! Verdict – David preferred the BLTP; while I enjoyed the full BLTAP. What other ingredients have you added to the BLT?